Time for the Rose City Roll Call! I've been very lucky for the past few years to live in Baltimore, where it was easy to get to comics shows, and I had two of the best, Baltimore Comic-Con (more on that show later this week) and the Small Press Expo, right nearby. Unfortunately, I can't make it to either of those shows, but luckily, there's a relative newcomer, the Rose City Comic Con, here to help me enjoy hanging out with creators as big as Kurt Busiek right down to up and coming folk like Periscope Studio's Ben Dewey, who is about to hit it BIG, unless I am very much mistaken. Held on September 20th and 21st this year at the Oregon Convention Center just across the river from Downtown Portland, Rose City Comic Con impressed me last year when I attended back when I was a guest to Portland and not a resident. There were a few glitches, but when I learned it was the first time they'd had it at a major-league sized venue, I really couldn't believe it. Though, as with most Comic Cons these days, Rose City has a heavy media focus, there's still an amazing murderer's row of creators who will be there, because Portland and vicinity is such a hotbed of comics (and a great place to live). Whether it's the names you'll see on the guest list or folks hanging out in Artist's Alley, there's so much to see you'll easily hit your comic-buying budget in no time. And that's okay, because the Panels this year are even better than last year, when they were pretty damned good. As we do with other shows, Rose City is getting its own focus, which we're calling Rose City Roll Call. * Some creators will be at both SPX and Rose City, and we'll note that accordingly. Look for the first Rose City Feature a bit later today, when we lead off with Jamie S. Rich! When the first feature is live, you can see all the Roll Calls at this link. 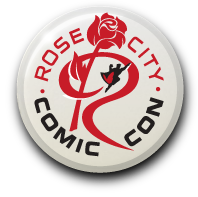 Of the Panel Patter crew, Rob McMonigal (aka me) will be at Rose City at least on Saturday. Hope to see you there!